A fine selection of 128 themes for Yosemite. Change the look of your Mac! A fine selection of 128 themes (+ variants) for OS X Yosemite. Designed and built from the ground up for OS X Yosemite. A completely rethought User Experience through an elegant UI! Introducing a new lightweight, fast and safe theming engine. Light: lightweight engine with overall better system performance. Fast: fast theme generation, fast theming engine, and apply themes instantly (no need to logout to see changes). Safe: seamless system integration, no system files modified on disk. Themes: bundled with a hand picked fine selection of 128 themes (+variants) for OS X Yosemite. Variants: choose from multiple artistic variations. Get Flavours news and updates from Interacto Labs! Low traffic, no spam. Flavours 2 Lite is bundled with a hand picked fine selection of 128 themes (+ variants) for OS X Yosemite. Flavours will NOT support OS X El Capitan (10.11) - check the FAQ below for more information. Will there be a complete version? What about El Capitan? Apple introduced a new security policy on OS X El Capitan, preventing every process (even privileged ones) from modifying system files, either on filesystem or dynamically at runtime. Unfortunately, with these security restrictions in place, this is the end of line for Flavours. 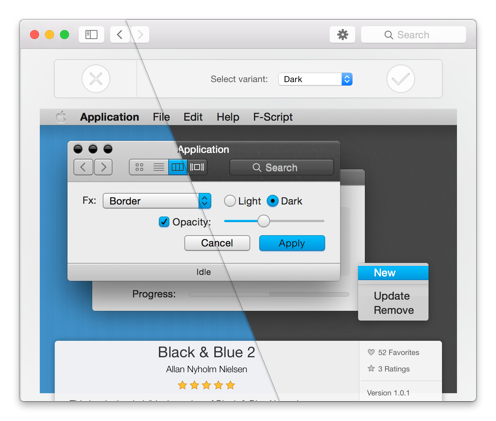 For years, we have put our love and passion on Mac theming. We initially released "UNO - The Unified GUI" for 10.4 back in 2006. Flavours development started shortly after 10.5 was released, in 2008. With lots of dedication and personal sacrifice, we took about 5 years to release Flavours Classic (1.x) which supports 10.7, 10.8 and 10.9. 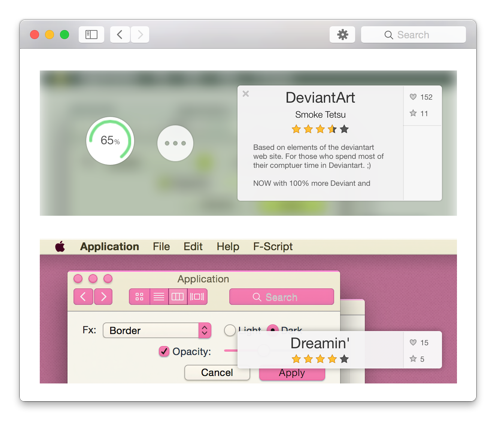 On OS X Yosemite (10.10), Apple introduced fundamental UI changes, visible and under the surface, which forced us to restart and redesign Flavours (2) from ground-up. During all this time, we have invested lots of time, resources, love and money on Flavours development; our return was terribly poor, but at least we were paid with love and engagement from the community. Now, with OS El Capitan (10.11) announced for Fall 2015, we decided to halt all further development on Flavours, and release Flavours 2 Lite bundled with a hand picked fine selection of 128 themes for OS X Yosemite. We hope you enjoy Flavours 2 Lite, which is, probably, the last breath of theming on OS X. Subscribe our Newsletter for future updates. Flavours 2 retail price will be $20. Flavours 2 Lite retail price is $5. Existing Flavours 1 licensees are eligible for an upgrade at a discounted price (50% OFF). Does it run on my Mac? Flavours 2 runs on OS X Yosemite (10.10) only. OS X El Capitan (10.11) will NOT be supported. If you are running older OS X versions (10.7, 10.8 or 10.9), please check Flavours Classic. An error prevented from sending your message. Please contact us via support@interacto.net.